I love your take on the color challenge! This is so pretty. I love how you put it together; your photos are adorable, and the WA is perfect! Great LO -- the top and bottom borders frame the LO nicely, and the photos are adorable! Nice job! Just lovely Sara. Your photos are great and I always like seeing the silly along with the "perfect" one. Love the collection you used and really like how you put your pretty background together so creatively. Super super page Sara - love the colours, Christmassy but not "in your face" so. They are so adorable!! I love the pink background. Great job on this, Sara! Lovely soft colors - great photos. Great muted Red and green - love it! Great page Sara!! Lucy & Campbell are growing up! I like that you used the "serious" photo and the goofy one! Love how you used these collections. 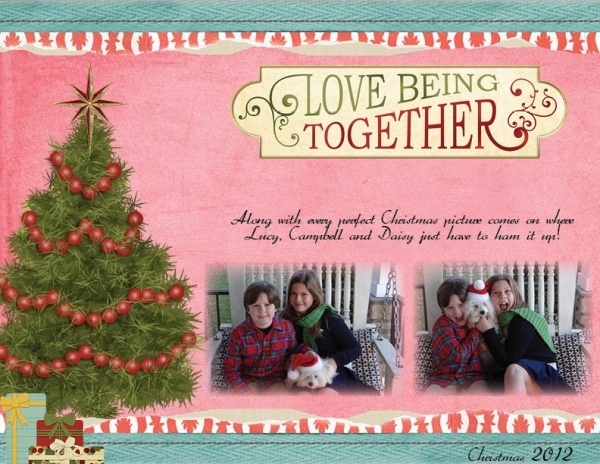 Lucy, Campbell and Daisy (love her santa hat) are so adorable together. The pink and blue background is lovely with the soft red ornaments in the Christmas Tree. Great blending of the photos too! That's a great collections, Sara. I really like the wordart you chose and the layering.